A row is looming between Beijing and Washington over China's proposed sale of two nuclear power-generating reactors to Pakistan. This would appear to break the guidelines set by the Nuclear Suppliers Group (NSG), a gathering of countries who export civil nuclear technology. The NSG's annual meeting is taking place in Christchurch, New Zealand all this week and it provides the first opportunity for other governments to explore what exactly China is proposing. "During recent weeks Beijing has come under growing pressure," says the veteran nuclear expert Mark Hibbs, of the Carnegie Endowment for International Peace. "And what I expect to happen is that the Chinese will make some kind of statement to clarify their intentions." Mr Hibbs does not expect any fireworks yet, not least because there is no agreement within the NSG over how to proceed. But the diplomatic battle lines are already being drawn with many countries eager to avoid the bruising exchanges of just a few years ago when, in 2008, the US - backed by a number of other major powers - pushed through a special exemption at the NSG allowing it to sell civil nuclear technology to India. This exemption - despite the fact that India has never signed the Nuclear Non-Proliferation Treaty (NPT) and has an active nuclear weapons programme - was strongly condemned by many arms control advocates. It has already prompted charges of double-standards. Iranian President Mahmoud Ahmadinejad, for one, has claimed that his country is being denied nuclear technology even though it has no nuclear weapons, while a special deal was cut for a friend of Washington - India - which already had the bomb. Mark Fitzpatrick, the chief proliferation expert at the International Institute for Strategic Studies in London, said he remained of the view that the US-India deal set "a dangerous precedent. "It strengthened the sense of double standards," he argues. Even Mark Hibbs, who believes that the US-India deal had "a deep strategic rationale" says "the problem was the way in which Washington set about it." The administration of former President George W Bush, he argues, simply "ignored the proliferation concerns". Washington should have been much tougher in extracting concessions from India, Mr Hibbs says. Now the India exemption hangs like a shadow over the deliberations of the Nuclear Suppliers Group. It cannot come to any view until China makes its hand known. So what will Beijing do? Mark Hibbs believes that China really has three options. Follow the US-India example and seek a special exemption for the Pakistan sale. Try to claim that the two additional reactors were in some way part of an original deal under which it has already supplied two reactors to Pakistan. This was in the works before China joined the NSG in 2004. Simply ignore the guidelines and go ahead with the sale anyway. Seeking an exemption, which appears to be the route that the Obama administration wants China to pursue, could throw the whole organisation into chaos. Seeking so-called "grandfather rights" to include the new deal in the previous contract might be preferable. But, inconveniently, Mark Hibbs believes that there is a paper trail suggesting that China had no intention to make further reactor sales to Pakistan when it originally joined the NSG. Ignoring the guidelines altogether would set a dangerous precedent. China plans to become a big player in the civil nuclear industry. 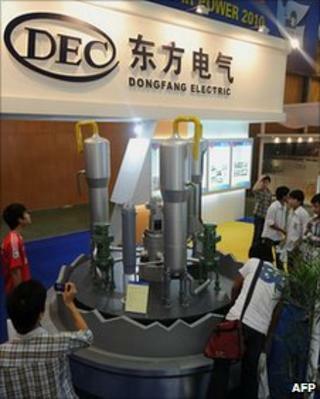 It has a huge domestic nuclear power programme and it has ambitious plans for major sales abroad. China's whole emergence onto the world stage has been conditioned by a desire to play by the established international rules. Overturning the NSG guidelines would undermine the whole cause of nuclear non-proliferation. A crucial element will be how the Obama administration chooses to play this issue. "Up to a few days ago I thought that the US and China had cut a deal to allow Beijing to go ahead. But now the US is raising questions," Mark Fitzpatrick says. Some analysts wonder if the US, like many members of the NSG, might simply prefer the whole issue to go away. But that clearly isn't going to happen. There could well be strong pressure from Capitol Hill for President Obama to oppose any sale of reactors to Pakistan. The country - like India - has never signed the NPT. It too has a small nuclear arsenal. And, more worryingly, proliferation experts say it has a terrible record of selling nuclear technology and knowhow to third countries. A further complication lies ahead. If both India and Pakistan were to gain exemptions, then Israel too (in exactly the same position: outside the NPT and believed to have a significant nuclear arsenal) would come looking for a deal on civil nuclear technology. That would present the Obama administration with a huge dilemma with major repercussions throughout the Middle East. The proposed China-Pakistan nuclear deal may well be a diplomatic problem that fizzles for a while rather than exploding immediately into life. But it has huge implications that go way beyond just the relationship between India and Pakistan and the already somewhat strained ties between Washington and Beijing.